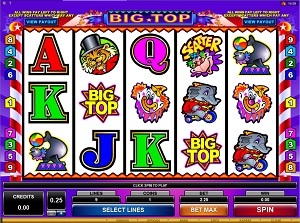 Big Top is a bright and colorful online video slot game from Microgaming which has been released in November 1999. This online video slot machine game has 5 reels and 9 pay lines. The theme of Big Top, as its name implies, is all about the happy and colorful things you can see at a circus show! Several online slot players love playing this slot machine game as it brings out a genuine impression of a real land-based casino slot machine in every way. Aside from its entertaining circus ambience, Big Top has colorful symbols and easy-to-understand payouts and rules, which makes this particular slot game a great choice for beginners. You will certainly enjoy forming winning links with talented elephants and seals. Also, you will have to keep a lookout on those “wild” and “scattered” monkeys they have, because they will help you complete winning combinations and make your rewards much bigger! Most Microgaming online slot games are available in 2 formats. The first format is the one preferred by most players, which is the download format. The second format is the Flash or browser-based version, which means there is no need to download anything at all. Whether you like to download or not, Microgaming has slot games for all your slot gaming needs. Big Top can be played for free instantly, which means you do not have to download anything initially to enjoy playing the game. If you are one of those who are fairly new to online slots games and you like going to a circus show (or you’ve never been to one), then give Big Top a try and you will surely have fun! The Big Top online slot machine game features 5 reels and 9 pay lines, wild substitutions, scatter wins, a maximum coin jackpot of 5,000, and it even has an Autoplay function to make your game play much easier and more exciting! When it comes to downloadable software from Microgaming, your game play is guaranteed to be fun and exciting as they provide spectacular graphics, a huge collection of games, and most of all, it is entirely user-friendly. Big Top is, just as its name implies, a slot game that is full of bright and colorful symbols that you see in a typical circus such as clowns, seals playing balls, monkeys, tigers, and elephants. The background setting of the reels, if you look at the top part, you will see the big tent or big top of a circus show. The line indicators are pinned to pillars designed like candy canes. The symbols are drawn in a cartoonish manner, and playing this game will not hurt your eyes. The background of the reels has a solid silver color, making the symbols more visible and neat to look at. The overall graphic design of Big Top clearly displays all circus characters happily doing a performance under the brightly-colored “big top”. There is actually no constant background music you will hear when you are playing Big Top. When you spin the reels and hit winning combinations, you will hear the familiar sounds of a traditional slot machine game in land-based casinos. The card deck symbols available at the Big Top online slot game include 10, J, Q, K and Ace. The other symbols that you will find in the Big Top online slot game are the Big Top Logo, and other animal attractions you will find in a circus such as the Clown, Elephant, Seal, and the Ring Master (in a tiger costume?). The Wild Symbol is the Wild Clown. The Wild Clown symbol acts as a substitute for other symbols (except for the Scatter symbol) in order to help you form winning combinations. The Wild Clown symbol only comes out on the 2nd, 3rd, and 4th reels. Please take note that only one winning combination is rewarded per payline. If you get more than 1 possible winning combination on a payline, you are just rewarded for the highest combination only. The Scatter Symbol is the Monkey symbol. The scatter symbol is not required to appear in a line (on an enabled pay line) for you to win. The Monkey scatter symbol can be found scattered anywhere on the 5 reels, and you are able to form winning combinations as long as there are 3 or more Monkey scatter symbols that appear. Your winnings are calculated by multiplying the Monkey scatter symbol combination payout (refer to the Payout table) by the total number of coins you’ve bet. Please take note that if you get a scatter win and a regular win, then you are paid out for both of these wins, because the Monkey scatter symbol is not required to come out on an enabled pay line for you to win. Scatter awards are independent from pay line awards, and thus they are added to the pay line win. Big Top does not have a Bonus Feature game. Big Top has 5 reels where you may bet on 9 pay lines. The minimum bet is 0.01 and the maximum bet is 10.00 per line. You can wager 1 coin only per pay line. Thus, the minimum amount you can bet is 0.01 and the maximum amount you can bet is 90.00 per spin. Online video slots are much easier and more fun to play when it has an Autoplay function. In Microgaming online slot games, they have 2 game modes – Regular mode and Expert mode. If you would like to play the Big Top online video slot game automatically, all you need to do is access the Autoplay function by clicking on the “Expert” button located at the left corner of the game screen. In it, you will find the Autoplay setting that lets you play a desired number of consecutive spins automatically. When you are satisfied with the settings, you can “save and close” or “Start” playing the Autoplay functions straightaway.